Memorial services at Alps Road Presbyterian are held for members and nonmembers alike. Alps Road's pastor officiates at all services, and a guest pastor, as requested by the family, is welcome to assist. Our pastoral staff will provide assistance and comfort to families at this particular time of need. To arrange for a memorial service please contact the Church office at 706-549-9284. THE MEMORY GARDEN CONCEPT . . . Since ancient times, Christians have buried their dead in the churchyard, symbolizing the continuum of faith from birth to death, baptism to burial. In keeping with this tradition, Alps Road Presbyterian Church hereby establishes a Memory Garden to receive the cremated ashes (cremains) of Alps Road’s members and their families. A landscaped area on the south side of the sanctuary, immediately behind the McDonald Parlor, is set aside as the Memory Garden and as a quiet setting for reflection and prayer. On the outside back wall of the McDonald Parlor a memorial plaque shall be placed to list the names of those whose cremains are placed in the Garden. The Garden will be used to receive the cremains of Alps Road Presbyterian Church members, their immediate family members (spouses, parents or children) and former church members. Deceased persons whose ashes are not interred in the Memory Garden may be memorialized in other ways and in other places in the church facilities rather than on the Memory Garden plaque. It is not permissible to use the Garden to scatter or bury cremains of family pets nor have the names of pets recorded on the Memorial Garden plaque. Any questions of eligibility are to be referred to the Session. IS THE GARDEN A CEMETERY? The Memory Garden is not a cemetery in the usual sense. Cremains only may be buried in a small hole in the Garden, or scattered about the Garden, They become a part of the life of the Garden. No urns or other containers are to be used. Markers designating deceased persons are not allowed at any place in the Memory Garden. On a plaque on the outside back wall of the McDonald Parlor there will he space for a two-line name plate to record the name and years of birth and death for each person whose crernains are placed in the Garden. Family or loved ones of the deceased will be responsible for the cost of each name plate, which may he ordered through the Alps Road Church office. The Session Record book will record the death and interment as a part of the permanent record of the church. There shall be no fee for the burial or scattering of cremains in the Memory Garden. Survivors, if they wish may contribute to the Memory Garden Fund for the maintenance of the Garden. Cost of the two-line name plate for the Memory Garden Plaque will be the responsibility of the family or loved one of the deceased. Expenses are to be met by gifts to the Memory Garden Fund. Ultimately, Alps Road Presbyterian Church assumes the moral responsibility of maintaining the Garden for the purpose intended. be used to cover the buried cremains. • The cremains may he scattered at any place in the Memory Garden. 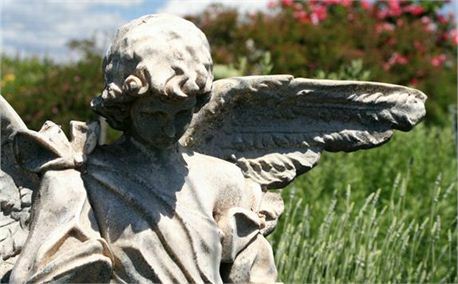 If no Funeral or Memorial Service is held, families may choose to have a private Memorial Service conducted in the Memory Garden at a time selected by the family and Alps Road’s Pastor.